Today, I want to tell you about something new happening with the Amaretto Market Owners Coalition (AMOC). 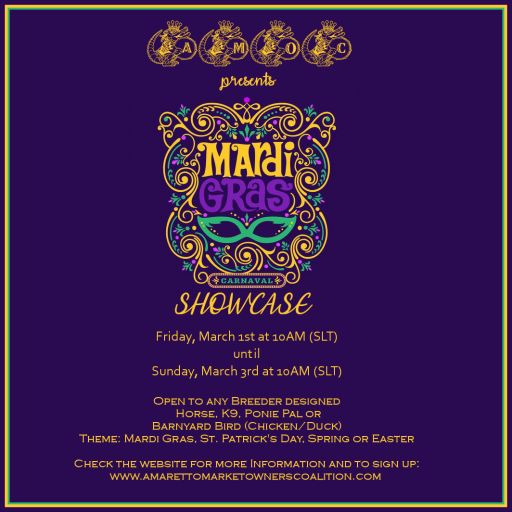 Get ready to take a trip down to the ‘Big Easy’ when AMOC presents the first ever Mardi Gras Carnaval Showcase. It’s always a party in the French Quarter of New Orleans, the city’s historic heart, famous for its vibrant nightlife and colorful buildings with cast-iron balconies. Stroll down Bourbon Street for a chance to win some awesome Amaretto prizes! Setup will be on February 28th and the contest will start on March 1st at 10am (SLT) and end on March 3rd at 10am (SLT). Judging will be by a panel of pre-selected judges. It’s easy to participate. All you have to do is sign up and set up! Entries can be any breeder designed Horse, K9, Barnyard Bird (Chicken/Duck) or Ponie Pal. Showcase themes are Mardi Gras, St. Patrick’s Day, Spring or Easter. *Reminder: you cannot enter an LE, SE, CE or DE as they are Amaretto creations. Entries are limited to 15, so enter TODAY! Want to see the build before you sign up? No problem! The February AMOC General Meeting will be held at the contest site. Watch group notices for the meeting coming up this Friday, Feb 8th at 1PM!